everything LEB: All Aboard, its Party Time! All Aboard, its Party Time! Kristine over on Living With Style is on the host list for a super exclusive event coming up on August 18th here in Boston! 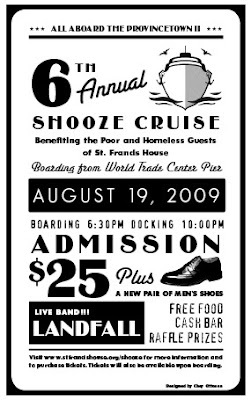 The annual Shooze Cruise benefits the St. Francis House and provides men's shoes to the less fortunate. The cost is $25 a person and a brand, spankin' new pair of men's shoes!! The boat leaves from the World Trade Center at 6:30pm and docks at 10pm. PS- one of the AWESOME raffle prizes is a Kristine Mullaney Design gift certificate, a value of $325.00 woohoo!!!! Lindsay, you are too funny! Thank you for the post. It will really be a fun cruise - hope to see you there! Thanks a bunch ;)!